SIL tried to drive to us this morning so we could have the kids whilst her & her husband tried to clear up but she couldn’t get out of the area. An area about two square miles where they live is totally cut off by road & some people have been evacuated by boats. Some friends of ours were moving house yesterday. Half of their stuff is in the old house which is within this area & half of it to the new house. His mother picked their 3 year old son up from nursery as they couldn’t get to him but then she was flooded as well. So they had to borrow a big van today & drive through the roads that are closed against all advice to reach their son as Grandma has no power & it wasn’t safe for him to be there. They took it very slowly & managed to get to him without stalling the engine. >Glad to hear that you guys are safe and well and relatively well off, but I’m sorry about your family and friends 🙁 We are extremely lucky on this side with no flooding at all, although work usually gets a few leaks. Nothing major though. >How awful, makes it seem more real reading all this on your blog, rather than just seeing it on TV. Glad you are all safe though, and how kind of DH’s work mate. >Looking further afield (aka the weekend) it is not looking good. We are expecting to have between 20 to 60mm of rain over the weekend (2/3 of what we had last weekend!) All of which will fall onto rain sodden land and concide with very high tides. This weekend is a very important time. >Hope your water recedes soon and the clean up op isn’t too bad. 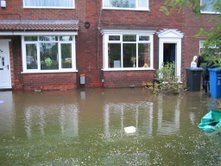 I managed to leave Sheffield the night before the flood and most of the family are ok except for 1 sister’s house + cellar flooded. Hope your employers are being reasonable about the time off! 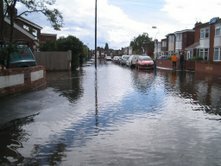 >So sorry to hear about all the flooding. It is just awful. Hoping things settle down very soon! >What an experience for your family and friends. I can well imagine the awfulness of it, and I just hope that the water clears up quickly and the insurers are co-operative. I’ve found it a very unnerving experience altogether and I know I didn’t suffer the worst of it.